Two newly acquired works by iconic light artist Robert Irwin, now on view in the Jane and Richard Levin Study Gallery, have transformed the museum’s holdings of contemporary art. Widely considered to be among the most important artists of our time, Irwin began his career as a painter in the 1950s and became a pioneer of the Light and Space movement in California in the 1960s. During the sixties, Irwin shifted his focus from small-scale abstract dot paintings to large, three-dimensional acrylic discs and columns, investigating the ways in which visual experience is shaped and framed by both artist and viewer. 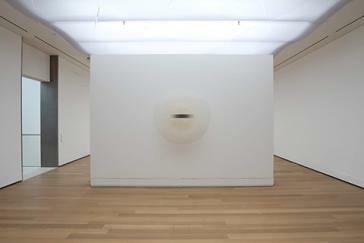 The works on view—a dot painting (1963–65) and an acrylic disc sculpture (1969)—illustrate the artist’s preoccupation with light, space, and human perception.